Dactylosaurus is one the European pachypleurosaurus. It belongs to the family Pachypleurosaurus. Dactylosaurus is the sister taxon to Anarosaurus and Serpianosaurus. 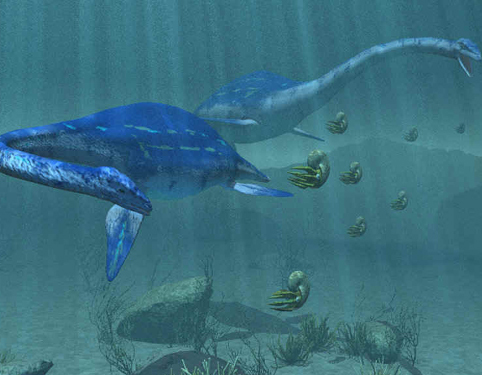 It is believed that over 10 million years ago these Dactylosaurus were found in the Europe region. And there had been more variation in the head region of these pachypleurosaurus. In this genus the nasal bones are broadly sutured and the nasal bones meet. Dactylosaurus had cervical ribs and these have anterior processes. In this genus, there are 17 cervical vertebrae. Dactylosaurus has broadly extended maxillae on up side of the snout. The skull of this genus gradually shaped into triangular shape in the further species. The Dactylosaurus has small posterior process that separates the anterior ends of the nasal and these extends up to the posterior rim of nares. The maxillae in Dactylosaurus are broadly extended up the side of the snout and reaches above the mid point of the orbit and it ends with nasals in wide suture. The humerus in adult Dactylosaurus is about 3.5 cm long. Dactylosaurus have distinct deltopectoral crest. This genus has clearly defined articular condyles and these have a prominent entepicondyle. All the characters of the humerus can be seen in this genus. The number of bones in manus (hands) and the number of bones in pes (feet) are less in number. That is the dactylosaurus have lesser number of bones in manus and pes when compared with that of other dinosaurs, which belong to its family. Dactylosaurus have relatively long open UTF. In Dactylosaurus genus we can observe pterygoid transverse process. The prefrontal in the Dactylosaurus is inflated. In this genus we can find the premaxilla narrow and we can observe that the posterior process is short. Nasals in Dactylosaurus do not reach the level of orbit. The post frontal and the postorbital in the dactylosaurus are inflated. We find in Dactylosaurus that the postfrontal reaches UTF. We can observe the abrupt bend in the humerus. Dactylosaurus has well ossified phalanges. There are 4 distal carpals in Dactylosaurus. The Dactylosaurus has three ossified carpals. The dorsal centra of Dactylosaurus are slightly inflated and it appears like a groove in the lateral view. The inner surfaces of radius and ulna in this genus are appressed, these are not concave. The articulation in this genus lies in the transverse plane. This articulation restricts the lateral bending. The dorsal ribs in this genus are without pachyostosis. The coracoids proximal expansion in this genus is weak. And the deltopectoral crest is not differentiated in this genus. Entepicondyle cannot be identified in Dactylosaurus. The intermedium is rectangular and long. Dactylosaurus.gracilis is one of the species found. The ulna and radius of this species are slimmer than that of Neusticosaurus. D.gracilis is the smallest known pachypleurosaurus. At a much smaller size this species reached the adult degree of ossification of bones than the other forms.